"O you who believe! Have Taqwah (true fear of Allah) according to His right and die not except that you are a Muslim. OMankind! Have Taqwah of your Lord. The One Who created you from a single soul and from him He created his mate and from them both He created many men and women and fear Allah through Whom you demand your mutual rights and do not cut off the ties of kinship; surely Allah is ever a Raqeeb (All-Watcher) over you. O you who believe! Have Taqwah of Allah and always speak the truth. He will direct you to do righteous good deeds and will forgive you your sins. And whosoever obeys Allah and His Messenger (saws) he has indeed achieved a great achievement." Verily, the best speech is the Book of Allah and the best guidance is the guidance of Muhammad ibnu 'Abd Allah (saws). The worst of all affairs in this Deen are innovations. Every innovation is a Bid'ah and every Bid'ah is a going astray and every going astray is in the Hell Fire. properly apply this love for the last Prophet (saws) is to properly implement the testimony: wa ash hadu ana Muhammadan rusulu Allah (saws). Indeed, one cannot just say he/she loves the Prophet (saws) while his/her actions and 'Aqeedah are fundamentally against what the Prophet (saws) brought (i.e. the Qur'an and the authentic Sunnah). Hence, the first step in the process of developing this love is to acknowledge that the Prophet (saws) has a claim over the believers. "The Prophet (saws) is closer to the believers than their ownselves..."
1. We consider Allah's Messenger (saws) to be dearer than one's own self. This is so because this claim is based on love. One has the most claims to oneself for one loves oneself more than anything. Thus, a person knows what types of foods, clothing, etc. he/she likes to eat, drink, etc. more than all others. However, when it comes to Islam, we know that Allah knows us better than we know ourselves; thus, we submit to Him and His Orders. When it comes to the Prophet (saws), we are to love him more than our own selves; thus, we too put his commandments above our own opinions, logic, etc. 'We were with the Prophet (saws) and he was holding the hand of 'Umar ibnu Al-Khattab (ra). 'Umar said to him, "O Allah's Messenger (saws)! You are dearer to me than everything except my ownself." Allah's Messenger (saws) said: "No, by Him in Whose Hand my soul is, (you will not have complete Faith) untill I am dearer to you than your ownself." Then 'Umar (ra) said: "However, now, by Allah, you are dearer to me than my ownself." He (saws) then said: "Now, O 'Umar, (now you are a believer)." the Prophet (saws) to be dearer to him/her than everything including one's ownself. Upon hearing that true Imaan can only be achieved through loving the Messenger (saws) more than everything, including one's self, 'Umar (ra) quickly complied with the Commandment of the Prophet (saws). The Sahabah wasted no time in doing those acts which were pleasing to Allah and His Messenger (saws). the Book of Allah and the authentic Sunnah of His Messenger (saws). a. One must confess his/her belief in Islam (i.e. one must be a Muslim). b. One must have Ikhlas of the Niyah (i.e. purity of the intention). done in accordance with the Book and the Sunnah; however, he/she did not know the way to make Wudhu according to the Book and the Sunnah; hence, their Wudhu would be accepted for a. and b. were fulfilled, wa Allahu 'alam). . These are the conditions, which the Salaaf As-Salih (Pious Predecessors) understood with regards to the acceptance and rejection of a deed. Another implications of the testimony: Muhammad is the Messenger of Allah (saws). Huwa (none has the right to be worshipped but He). It is He Who gives life and causes death. So believe in Allah and His Messenger (saws), the Prophet who can neither read nor write, who believes in Allah and His Words, and follow him so that you may be guided." The Prophet (saws) said: "And the Prophets were formerly sent to their people only, whereas I have been sent to all mankind." Therefore, recognizing that he (saws) was sent as a mercy to all of mankind will, Insha'Allah, help kindle the proper love for him which will be manifested through obedience to his rulings. "Muhammad (saws) is not the father of any man among you, but he is the Messenger of Allah, and the last (end) of the Prophets. Allah is Ever All-Aware of everything." The Prophet (saws) has said : "And the line of the Prophets is closed with me." "...This day, I have perfected your religion for you, completed my Favour upon you, and have chosen for you Islam as your religion..."
Thus, if Islam were not a complete way of life, then this religion would need to be constantly updated. In order to update this religion, there would have to be another Prophet after Muhammad (saws). However, this is not so as Allah completed this Deen and it can never be changed from its true form. 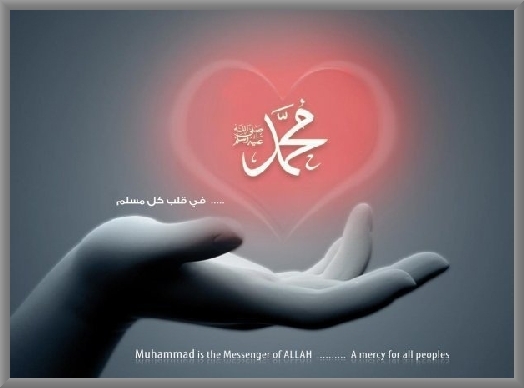 "Nor does he (Muhammad (saws)) speak of his own desire. It is only an Inspiration that is inspired." "Indeed, Allah conferred a great favour on the believers when He sent among them a Messenger (Muhammad (saws)) from among themselves, reciting unto them His Verses (the Qur'an), and purifying them (from sins by their following him), and instructing them (in) the Book (the Qur'an) and Al-Hikmah (the wisdom and the Sunnah of the Prophet (saws) - i.e. his legal ways, statements, actions, etc. ), while before that they had been in manifest error." "I have, indeed, been given the Qur'an and something like it along with it (i.e. his Sunnah)." "We sent no Messenger, but to be obeyed by the permission of Allah." "Obey Allah, and the Messenger (saws). But if they turn away (then know), that Allah loves not the infidels." 1. We believe in what the Prophet Muhammad (saws) has said. 4. We judge ourselves by the Shar'iah of Prophet Muhammad (saws), and not by any other law. 5. We love Allah's Messenger (saws) more than our parents, Children, all of mankind, indeed our very selves. "Say (to them O Muhammad (saws)): If you love Allah, follow me, and Allah will love you, and forgive you your sins; Allah is All-Forgiving, All-Merciful. Say: Obey Allah, and the Messenger (saws), but if they turn away (then know), that Allah loves not the infidels." "And let those who oppose his (Muhammad's (saws)) command beware, lest a trail befall them (that will lead them to Kuffur) or a painful punishment be inflicted on them." "You have indeed a good example in the Messenger of Allah (saws) for whosoever hopes for Allah and the Last Day, and remembers Allah much." "It is not for any believer, man or woman, when Allah and His Messenger (saws) have decreed a matter, to have the choice in their affair. And whosoever disobeys Allah and His Messenger (saws) he has gone astray into manifest error." "But no, by your Lord, they can have no Faith, until they make you (O Muhammad (saws)) judge in all disputes between them, and find in their souls no resistance against your decisions, but accept (them) fully with submission." Thus, we see in this last Ayah that Allah negates that a person can have Iman unless that person makes the Prophet (saws) judge in *all* affairs and that we accept his (saws) decisions with submission. This Ayah is indeed serious as Allah swears to this negation with His saying, "But no, by your Lord...". "All of my people will enter Jennah except those who refuse." When asked about those who refuse, he said: "He who obeys me will enter Jennah, while he who disobeys me has refused." He (saws) also said : "If anyone introduces into this affair of ours anything which does not belong to it, it is rejected." "None of you believes untill I am dearer to him than his father, his child, and all of mankind." "There are qualities for which anyone who is characterized by them will experiece the sweetness of Imaan: he to whom Allah and His Messenger (saws) are dearer than all else; he who loves a human being for Allah's Sake alone; and who has as great an abhorrence of returning to Kuffur (disbelief) after Allah has rescued him from it as he has being cast into the Hell Fire." Although the Prophet (saws) is the best of examples and following his Sunnah is obligatory, we must remember that it is not right to overpraise him (saws) as he was not divine, but a man. Some deviant sects of Islam direct their 'Ibaadah to the Prophet (saws); however, this is Shirk Al-Akbar (association in the highest degree) which will not be forgiven unless that person makes sincere Tawbah before his/her death. "Say (O Muhammad (saws)): I am only a man like you: it is revealed to me that your God is One God: So, let him who hopes for the meeting with his Lord, do righteousness, and not associate anything in the worship of hsi Lord." "Do not over praise me as the Christians over praised the son of Mary (i.e. 'Isa (as). I am His slave, so say: Allah's slave and Messenger." "Indeed, Allah and His angels send Salaat (i.e. Allah mentions the Prophet's (saws) name in the presence of the angels) upon the Prophet (saws). O you who believe! Send your Salaat and your Salaam upon him (ie. by saying Salla Allahu 'alaihi wa sallam, etc.)."